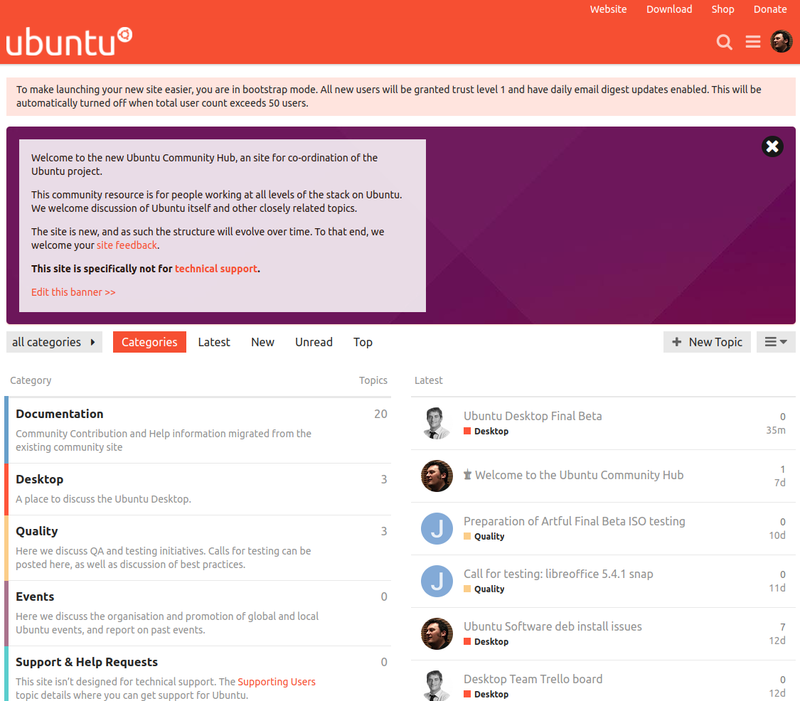 A while back Alan Pope proposed that we replace the old static Ubuntu Community site, which looked a bit like this, with something a little more dynamic. We want to smooth the onboarding process for new contributors. Since the blog post I have spent some time getting feedback from people in the Ubuntu community and we’ve had a bunch of great tips and suggestions to ensure the site works effectively. 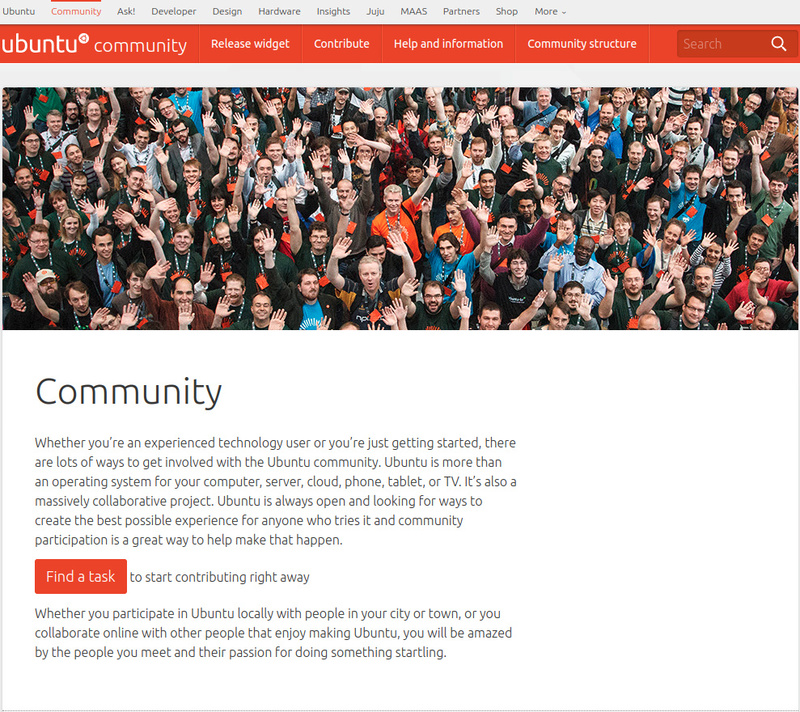 The site is now live at https://community.ubuntu.com/ - I’d welcome new and existing Ubuntu community members to head on over and take a look. We have opted to exclusively use Ubuntu SSO for authentication, so you won’t need to remember a new password. A prototype site was stood-up which allowed us to shake out installation and setup issues, and build the initial categories and theme. We created a basic Ubuntu branded theme which will do for the initial site launch, but could certainly be improved upon - CSS experts welcome here! We ported the existing content over from the static site into the documentation category. These have been converted to ‘wiki posts’ so they can continue to be easily expanded, refined and improved by future visitors. I’d welcome our active community members to re-review those periodically and help us to make them an accurate and welcoming starting point for new contributors. We created a few “seed” posts thanks to Will Cooke from the Desktop team, and Jean Baptiste on the subject of QA. We have a few initial categories to get things started. Desktop for discussion of the Ubuntu Desktop, where we expect there to be a lot of interest as the 17.10 release approaches, and people discover the new GNOME default desktop. The Quality topic is for co-ordination and announcements of QA activities, such as ISO testing, or where we have interesting new things landing which need wider validation. The Events topic was created for discussion of Ubuntu-related events. These could be meet-ups, UbuCons, Ubuntu Hours or any other appropriate in person or virtual advocacy activities. If you’re thinking of planning an event and want to discuss it with people who have trodden this path before, this is the place to do it. It would also be great to see posts in there after events have happened, detailing how things went, what activities were well received, and how things could be improved. The Site Feedback section and Uncategorised sections should speak for themselves. We will of course take a view on whether more categories are required as and when particular topics break out from the existing ones. For now, the existing ones should be sufficient, but if not, let us know. Finally, the site is very specifically not for technical support, so I’ve explained this in the Support & Help Requests category to make it clear. The site isn’t designed to be a replacement for all the other great places users can get technical help. So we’ve linked to them in the category description. I’d like to thank Gustavo Neimeyer for standing up the site prototype. I’d also like to thank Nathan Haines, Simon Quigley, Marius Quabeck, Will Cooke, Martin Wimpress and Didier Roche for all their work in keeping this little project pointing in the right direction. This is looking great, thank you @popey (and others who have helped)! Conrats @popey and to everyone involved in this endeavour. Great work.